Chief Instructor Charles Fink has been practicing karate since 1994 and teaching since 2002. He holds the rank of Godan (5th level black belt), an instructor’s license, and NCCP Certification. 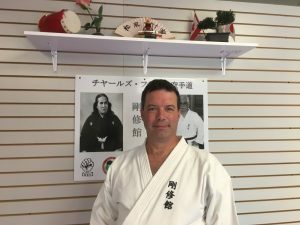 Adhering to high standards of coaching and pedagogy, Sensei Fink stays abreast of the latest developments in martial arts and sport science and continually strives to find and develop innovative ways to practice and teach karate. Sensei Fink has a B.A. in Psychology and a B.Ed. (P/J) from Laurentian University and a M.Ed. in Higher Education Leadership from the University of Calgary. When not practicing karate, Sensei Fink teaches at Laurentian University and Cambrian College. He is happily married and the proud father of two. Sensei Fink est parfaitement bilingue. Il lui fera plaîsir de vous adresser en français. We practice Goju Ryu Karatedo. Our curriculum, cultural heritage, and authentic techniques stem directly from Masters Gōgen Yamaguchi and Shuji Tasaki under the guidance of Seiichi Fujuwara, Hanshi. We are members of Canada Goshukan, the Seiwa Kai, and the JKF Gojukai. We also belong to the Ontario Karate Federation, Karate Canada, and the World Karate Federation. The Dojo’s main objective is to provide an opportunity for all members of the community to experience this classical form of Japanese karate in a safe and collegial setting. Karate is an individual pursuit. Each student advances at his or her own pace. However, the journey is much more pleasant in the company of others. We hope you will enjoy training and that the skills and friends you acquire here will last you a lifetime. Conveniently located behind Tim Horton’s on Falconbridge Hwy. in Garson, the dojo provides a clean and safe environment for teaching and learning. While spacious enough for practice, the limited size of the training space ensures small class sizes. There are clean and accessible change/washroom facilities on site as well as ample free parking. A viewing area allows parents, loved ones, and other visitors to spectate.